Opening any of the Bottled Faeries will give you blessings, which you can trade in for various abilities. The abilities that are available to your Neopet depend on which level your pet is at, and as your pet reaches a new tier, they can select one of three abilities from that tier. 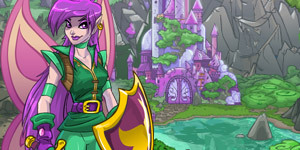 To trade in your blessings for abilities, visit Aethia at the Battledome. Once you have selected an ability at a level, you can change it later and you will only be changed half of the normal price to do so. For a listing of the abilities from the Old Battledome, check out our archival guide. "Or use it for an epic game of freeze tag." Effect: Prevents your opponent from using weapons on the round the ability is used. "A whopper, to speak in the vernacular of the peasantry." "Never upset someone who can turn you into a Mortog."